Three years ago, L.A. Sheriff Jim McDonnell banned a logo used by the department's East L.A. station because he felt it was disrespectful to the community. New Sheriff Alex Villanueva has revived the logo and it's once again displayed prominently at the station. 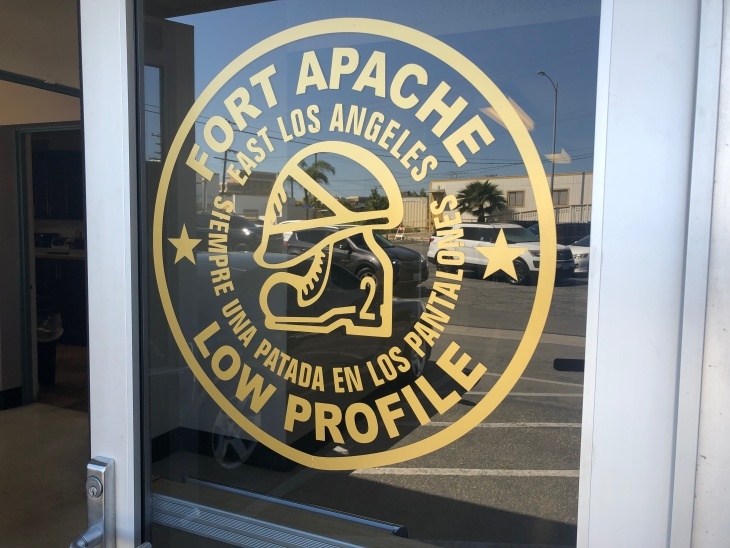 On Saturday, current and former deputies who've been stationed in East L.A. are getting together for a party in part to celebrate the return of the logo, which portrays riot gear emblazoned with the words "Fort Apache" and "Low Profile." Villanueva's move has drawn criticism from a community activist and a member of the Sheriff Civilian Oversight Commission. McDonnell ordered the removal of the logo from the station over concerns "Fort Apache" suggested deputies felt they were in conflict with the communities they policed. Fort Apache was the name of a 1948 John Ford western about an isolated U.S. Army post in the 1800's in the midst of Apache territory. The former sheriff declined an interview request, but Neal Tyler — his undersheriff at the time — spoke with LAist about McDonnell's decision. "Words have power. Symbols have power," Tyler said. "It does matter whether our symbols and our communications are civil and respectful." Villanueva, who once worked at the station and met his future wife when she was a deputy trainee there, overturned McDonnell's decision after his election last fall and the logo is once again on station walls, shirt pins and squad car bumper stickers. 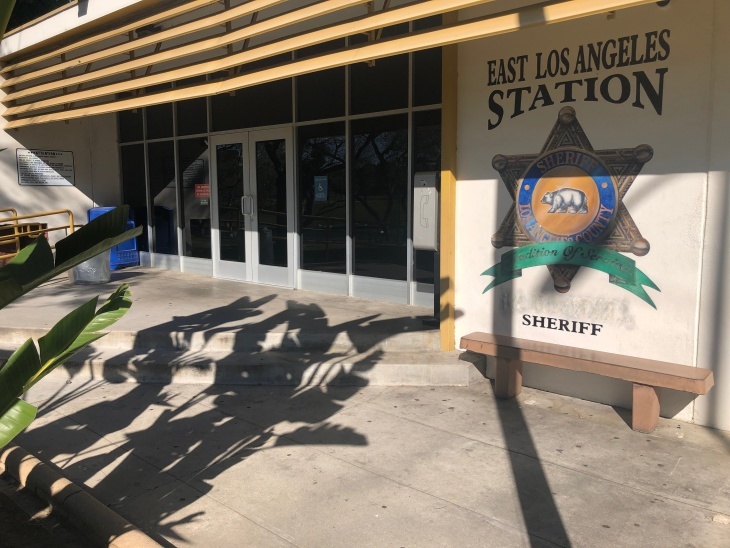 The sheriff declined to comment on why he restored the logo, but the department made the East L.A. Station's new captain available for an interview. "The symbolism for Fort Apache would be a lone outpost," Capt. Ernest Chavez conceded. "But it has no negative connotation. I think it was just something that stuck because of some of the incidents that were taking place throughout the community." McDonnell's decision to remove the logo angered many deputies at the station. "It was personal for me," Detective Leo Sanchez said on a recent afternoon as he stood beneath a flag with the logo flying above the station. "I took a lot of pride in the actual logo." Inside the station, Sanchez, a 23-year department veteran who was born in East L.A. and has spent the last dozen years at the station, pointed at the floor tiles in a central hallway. "You can see the darker ones and the lighter ones," he said. "Those are 16 tiles in a diagonal pattern. That's where the logo was." McDonnell first had the tiles covered with a carpet. Then, before he left office last December, he ordered the tiles torn out. Deputies at the station had a reverence for their logo — perhaps more than at any other station, Sanchez said. "We didn't walk on it," he said, pausing and lowering his voice. "We walked around it." 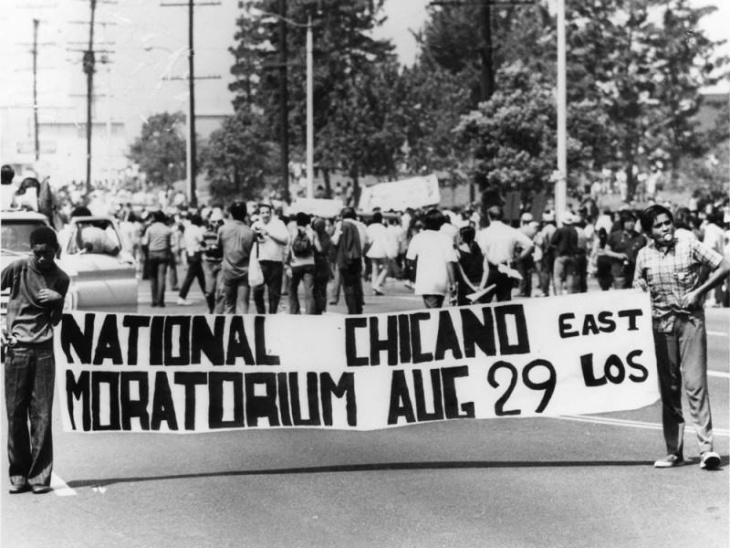 The logo was born out of violent clashes between East L.A. deputies and anti-Vietnam War protesters during the 1970 Chicano Moratorium. The sheriff at the time, Peter Pitchess, responded to the violence by ordering deputies to keep a low profile, prompting one to design a patch with a riot helmet sitting on top of a boot and the words "Low Profile." For Sanchez and others, those words mean, do your job quietly and don't draw attention to your accomplishments. 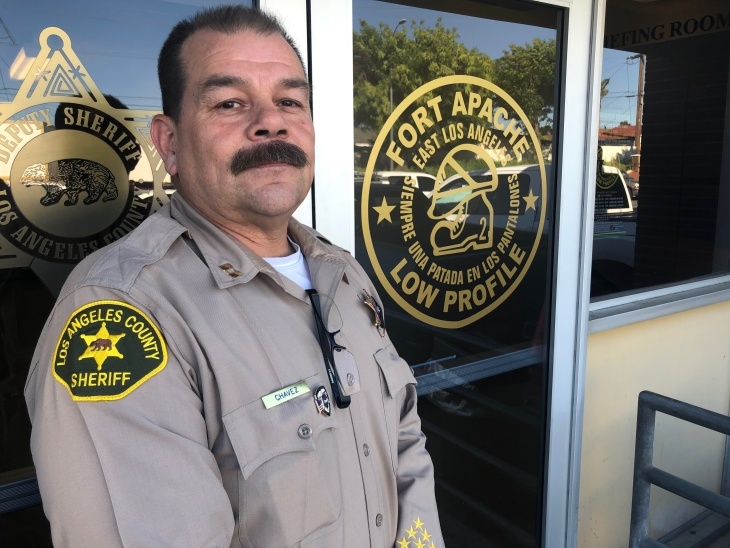 It wasn't long before deputies started calling their station Fort Apache and the name was added to the logo, said retired East L.A. Deputy William "Pico" Rivera. The logo was a source of pride and camaraderie, he said. Sitting at his kitchen table in East L.A., Rivera showed off a boot mounted on a piece of wood with a helmet on top — a memento he received when he retired in 2002. Gesturing to a Fort Apache patch on the table, Rivera, who was two years on the job at the time of the Chicano Moratorium, explained the meaning behind the words "siempre una patada en los pantalones" — Spanish for "always a kick in the pants." "As terrifying as some of those incidents are," he said, the job was also "fun, always a kick." "HE'S CRAZY! HOW CAN HE BRING IT BACK?" Some in the community have a very different feeling about the logo. When told that Sheriff Villanueva had restored the logo, longtime East L.A. activist Carlos Montes reacted with shock. "What? He's crazy! How can he bring it back?" he said. "We definitely will oppose it. We'll protest it." 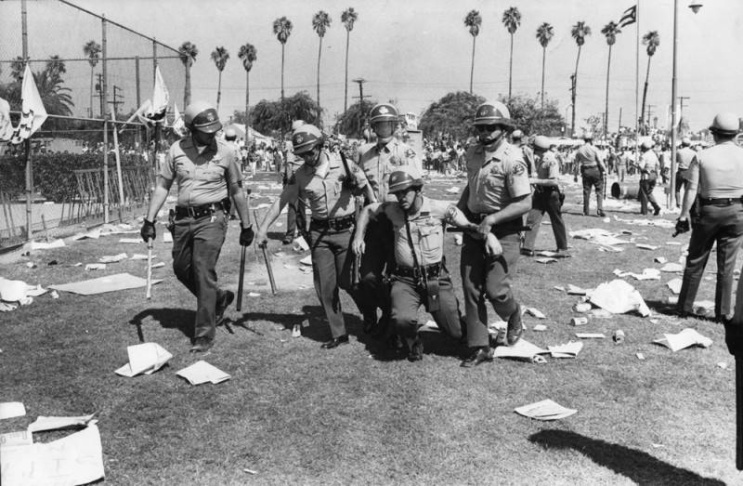 Sitting at a picnic table on the banks of Belvedere Park Lake, a stone's throw from the East L.A. station, Montes recalled that when the logo was created back in the 1970s, almost all of the deputies were white. "There was no question to us what 'Fort Apache' meant," he said. "They were in an outpost in the middle of the desert among the savages, the savage Mexicans, the savage Chicanos. So they had to have a fort to defend themselves." The logo wasn't controversial internally until 2015, when McDonnell ordered a review of the more than 100 logos used throughout the department. He decided 10 logos — including Fort Apache — gave the wrong impression and should be retired. Another logo that was retired was at the sheriff's gun range, where the cartoon figure Yosemite Sam with his two guns blazing adorned various walls. The return of the logo troubles Sean Kennedy, a member of the Sheriff Civilian Oversight Commission. Kennedy argues it's no coincidence that the station with the Fort Apache logo was home to the department's first deputy clique, or as he calls it, gang. "It probably explains why to this day we are having so many problems related to the East L.A. Station and the proliferation of deputy gangs," he said. Earlier this year, seven deputies from the East L.A. station filed legal claims against the department, saying they were beaten up by colleagues who were members of the station's Banditos clique, deputies who sport tattoos of a skeleton with a sombrero, bandolier and pistol. In 2014, L.A. County paid a female deputy assigned to the East L.A. station $1.5 million to settle a lawsuit in which she claimed she had been physically and mentally harassed by Banditos members after refusing to go along with the clique's "traditions and initiation rituals." Villanueva has said "hazing run amok" is the problem, not deputy cliques or logos. "I think that Sheriff Villanueva's position on logos and gangs has been a real step backward," said Kennedy, a former federal public defender in L.A. and a Loyola Law School professor who's studied the department's history of cliques. "THIS IS HOME TO US"
Asked if he is a member of the Banditos, Sanchez, the East L.A. detective, said no. 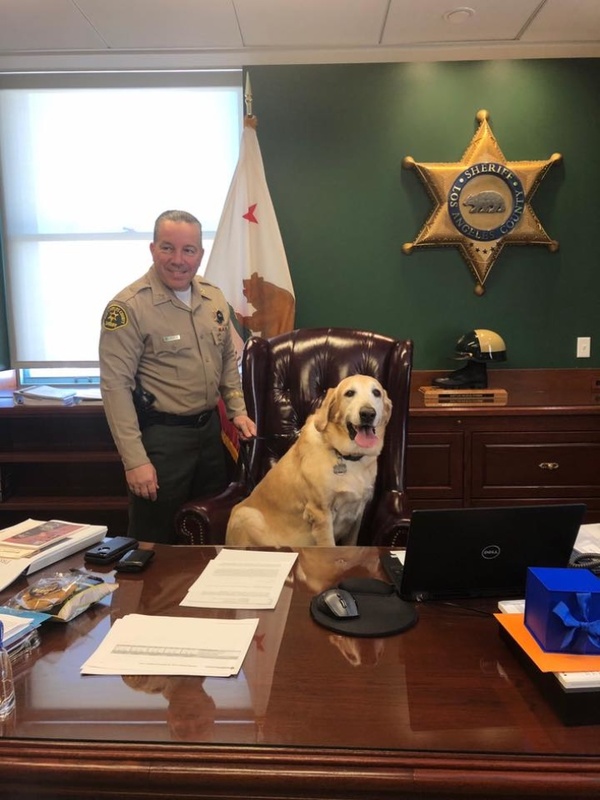 He called the September "incident" between deputies that prompted the legal claim "unfortunate." Villanueva has given deputies new hope that they'll be backed up in a way they felt the previous sheriff did not, Sanchez said. He also strongly objected to the idea that the Fort Apache logo means he sees the community as the enemy. "I fished in that pond," he said pointing toward Belvedere Park Lake. "I went to high school down the street. My parents live just blocks from here. So this is home to us." 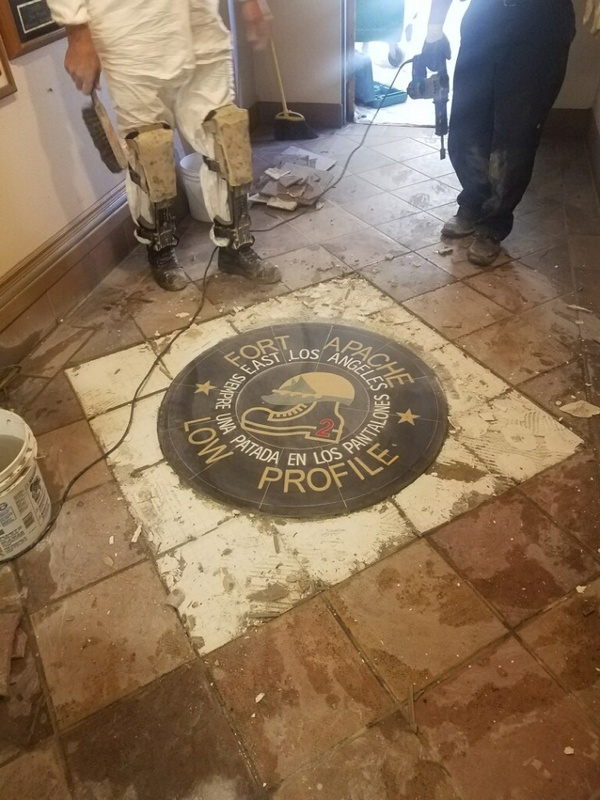 Sanchez said he expects new tiles depicting the Fort Apache logo to be back in the station's central hallway in a few weeks.